I have changed Elinor and Emma over to blogger. You can find it here. I will still keep this blog up, but if you want to comment, please comment on the Blogger blog. I went to the library yesterday and here’s some of the things I borrowed. Emma 2009 like I said I was in this post. I can’t wait to watch this awesome miniseries. Persuasion 1995. I watched this movie a long time ago and I didn’t like it very much. However, I hadn’t read the book yet (or any Jane Austen novel for that matter) so I think I’ll enjoy it more this time. Little Dorrit 2008. 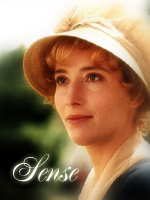 My favorite film of all time – it even rates above Sense and Sensibility 1995. I’ll be reviewing it on my book blog once I finish watching it. I also got a copy of Emma and Mansfield Park even though I have my own copies because I noticed that they had notes and interesting introductions (Yes, I do read the introductions to books). I’ll probably be watching Emma 2009 on Saturday. I can’t wait! Even though I watched it recently it’s the kind of movie you can pretty much never get tired of. My sister tends to prefer Romola to Gwenyth but I like Gwenyth better for the simple reason that she’s perfectly refined whilst Romola is a bit too modern for my tastes. Have you watched Emma 2009 and if so, what did you think of it. I recently read Miss Dashwood’s interesting post on Recasting Mansfield Park. I was thinking of what I could think up of along those lines and the first person who popped into my mind was Kiera Knightley as Mary Crawford. My mom said she always pictured Mary blonde, but I’ve always thought of her as dark. Opinions? 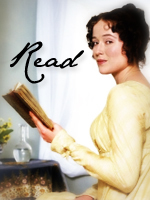 Anyway, I thought KK (the lovely, spirited Lizzy from Pride and Prejudice 2005) would make an awesome Mary Crawford. What do you think? When I was first introduced to Jane Austen, I picked Northanger Abbey. Why? It was the shortest and the summary on the back looked interesting. This is what happened: I got two pages into it and quit. I wasn’t used to reading ‘old-fashioned’ books and I couldn’t get through it. We had just finished watching Mansfield Park 2007 so I decided to borrow the book from the library (wrong choice!). I didn’t understand a word of it so I gave up. (It didn’t help that the film is nothing like the book). After that I backed off from Austen for awhile. A little later, I came across The Jane Austen Handbook in a little gift shop. My mom liked Jane Austen a lot so I decided to get it and if I didn’t like it, she could have it. I read it…and didn’t put it down for several days. Of course, I had never read any of Jane Austen’s books so I didn’t catch all the delightful hints that the author puts in. I worked up enough courage to try Austen again. I bought a shamefully “lopt and cropt” version of Pride and Prejudice at…the dollar store. It left out many things such as Jane’s visit to Netherfield and Lady Catherine coming to see Lizzy, but I enjoyed reading it. I then set out to read the full, unabridged book. I struggled through it for a few days and then finally found my pace and started to enjoy it. I still had trouble understanding parts of it so I read bits of it at a time. I finally finished it and as a reward, treated myself to Pride and Prejudice 2005. 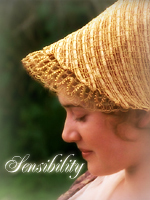 I read Sense and Sensibility a little later on, using the same method, and then finally all of her wonderful books. I thought to myself “There! I’ve finished them all and I can say I have.” But, like Lizzy with Darcy’s letter, they were soon brought out for further perusal. I am proud to say that I can read large portions of Jane Austen’s books without stopping for a breather. I have read all of them more than once and even got through Lady Susan (which wasn’t so bad once I got into it). My Austen collection includes all her major novels, an abridged version of Pride and Prejudice (not the one I mentioned above), The Jane Austen Handbook, Jane Austen Made Me Do It, Jane Austen: A Celebration of her Life and Works, and a ‘deluxe’ Pride and Prejudice 1995 DVD. Were you able to dive into Austen right away, or did you have to wade in? 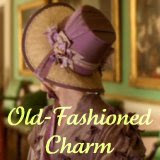 I am very pleased to announce that the winner of the JAHW fan-fiction contest is…Miss Laurie of Old-Fashioned Charm. Here’s her charming entry. In the parlour of a particularly fine London townhouse a group of seven genteel and elegant ladies were seated and all sipping at afternoon tea. A low hum of chatter filled the room as the ladies discussed the health of their parents, the growth of their children, the pleasantness of the weather and the state of the roads. Presently a handsome young woman with golden hair and hazel eyes stood amidst the group of seated ladies and drew everyone’s attention with a sweet but firm tone. “Sisters are very difficult things to completely surprise,” spoke up Mrs. Marianne Brandon with a pointed smile at her own dear sister Elinor. “What type of gathering were you considering Mrs. Bingley?” inquired elegant Mrs. Anne Wentworth. “I have considered all types of gatherings but have struggled to even pick the time of day to hold the party.” Jane Bingley sighed slightly. “Or a drive to Blaize Castle!” spoke up the chatty lover of books Mrs. Catherine Tilney with an eager tone. Catherine, who had always held high hopes of finding Blaize Castle to be a real old Gothic fortress could not hide her visible disappointment. “A picnic, although pleasant, will I fear be quite a cumbersome undertaking.” spoke up the ever sensible Mrs. Elinor Ferrars. “But Elinor, only think of how delightful an outdoor luncheon under shady trees in a picturesque setting would be!” Marianne interposed. “A card party perhaps?” the hitherto silent Mrs. Fanny Bertram suggested in a meek tone. “I am afraid neither Lizzy nor I were gifted musically.” Jane returned with a smile. “I would play and sing better if only I took more time to practice, as my Mr. Knightley is often reminding me.” Emma chuckled at her own faults. “I play a little and am very fond of Italian arias, but I would tremble to be examined by a master.” Anne admitted. “Dear me no! Yes, I suppose the musical soiree must be given up! 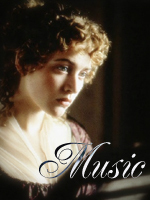 Poor lovely music, adieu!” Marianne sighed with regret as she spoke the last few words. Sitting next to her Elinor only shook her head. “Might we have a ball then?” inquired Catherine Tilney with more than a hint of excitement in her voice. The thought of a ball, even one so pleasant as this caused Fanny Bertram to grow a bit pale. From across the room Anne Wentworth had quietly observed Fanny’s eyes open a bit wider at the suggestion of a ball and her own heart filling with sympathy for the younger woman’s momentary discomfort caused her to speak up. “My dear Henry – err Mr. Tilney – is a most lively dancer and a most agreeable dancing partner!” enthused Catherine with a wide smile as she thought fondly of her first meeting in the Lower Rooms with her dear husband. “Mr. Bingley is just such another dancer.” Jane said with a soft smile that brightened her naturally pretty face. “Lizzy is quite fond of dancing, as am I. A ball would be just the thing if it was agreeable to everyone else. Mrs. Ferrars?” she sent an inquiring look to that lady. “Mr. Ferrars and I both enjoy a few turns about the room. But I must be excused dancing until three in the morning.” Elinor said good-naturedly. “I do, but…” there was a slight hesitation in Fanny’s reply. “But I cannot dance in my – condition.” she blushed deeper and averted her eyes slightly. “Oh my dear Fanny!” Marianne burst forth. “Why didn’t you say? How wonderful!” The smiles on the other ladies’ faces showed that they were equally delighted. “Thank you. You are most kind. I am quite comfortable. No, thank you, I am in need of nothing.” Fanny answered with a thankful heart. “Congratulations are most certainly in order!” Emma beamed. “Might we inquire when the little one is expected to arrive?” Anne smiled encouragingly at the expectant mother. Fanny’s natural modesty caused her to blush again but she fairly glowed as she said “At Christmas” with a gentle sigh of contentment. “A baby is such a blessing!” Catherine nodded emphatically. “At least that is what Mr. Tilney tells me each time a new baby is added to our batch.” Soft chuckles filled the room and a slight giggle from Elinor Ferrars to whom the impression of a Parsonage full of boisterous Tilneys was still fresh on her memory. “We are all very delighted by your news Mrs. Bertram!” said Emma. “Oh yes. I have briefly made him aware of my intentions and he has promised his support in conveying Lizzy to the event and concealing the surprise from her as much as possible. A ball, I believe would be agreeable to him. He cuts a fine figure and is not as averse to dancing as my family had previously thought him.” Jane explained. “Where shall we host this birthday ball?” Emma giggled. “Mr. Bingley will insist upon having the ball here in town and it should be quite convenient for surprising Lizzy.” Jane explained. “We will all be at your disposal Mrs. Bingley.” Anne spoke sincerely. “You may employ us on any errand.” Six graceful heads nodded and smiled in agreement. On the evening of her birthday Mrs. Elizabeth Darcy was escorted into the dining room by her husband followed by her sister and brother-in-law. Elizabeth could not contain a rather unladylike squeal of surprised delight on finding six of her dearest friends and their spouses concealed there. “This is a surprise party!” Emma Knightley clapped her hands in excitement. Behind her Mr. Knightley smiled kindly. “Happy Birthday!” Marianne and Catherine chimed and giggled at the unexpected unison of their wishes. “Jane you sly thing! You are the best sister!” Elizabeth embraced Jane warmly. “I understand now why you had so little time for me this week.” she smiled widely and her remark inspired a general chuckle from the gathered friends. “I felt quite sorry about putting you off but had you entered the house you might have guessed in a moment that preparations for a party were underway.” Jane explained. “Your sister had made me aware of them and it was all I could do to keep you occupied this past week. You can be a terribly inquisitive woman my dear.” Mr. Darcy teased his wife. The first floor rooms of Mr. Bingley’s London townhouse were ablaze with light and brimming with laughter and happy voices. In the ballroom the guests were assembled and the musicians were tuning their instruments in preparation for the dancing. From among the throng of family and friends who had joined the party for the dancing part of the evening, Mr. Fitzwilliam Darcy led his wife to the dance floor for they were to lead the way. They were soon joined in the set by the Bingleys, the Knightleys, the Brandons, the Ferrarses and the Tilneys for the first dance of the evening. Later Captain and Mrs. Wentworth would take the floor and Mr. Edmund Bertram would kindly partner a few young ladies while his precious wife stayed comfortably near the fire and what with one friend or another never lacked for a companion. As the evening wore on seven ladies could be seen at the top of the room chatting away while their spouses nearby were engrossed in a tale of the high seas as told by the gallant Captain Frederick Wentworth. The dancers in the center of the room finished a lively jig and the ladies were suddenly joined by a smiling but breathless couple – Mr. And Mrs. Henry Tilney. After a few witty remarks Mr. Tilney joined the gentlemen while his wife plopped into a chair and waved her fan vigorously to cool her flushed face. Though they had left the dance floor there were still many couples keeping up the revels. “God has blessed us all.” Fanny mused gently. Many of the friends stayed until very late enjoying each other’s company. As each of the eight elegant ladies retired for the evening their thoughts were filled with the many blessings bestowed upon them by the Author of their life’s story. I loved her entry. It was original and very entertaining. Here is the button I made up for her. What makes Jane Austen so re-readable? I can finish Mansfield Park or Emma and start reading it all over again (I have done this more than once). Or if I go somewhere and pick up a copy of a Jane Austen novel and start reading it, I can go home, pull out my personal copy and just read it all over again (I’ve done this too). I think one of the reasons that Jane Austen is so readable is that every reading provides us with something new to think about. I’ve read each of her novels (including Lady Susan, which I found quite interesting) several times over and each time I come upon something new that I had never seen. Her writing is not ‘deep’ and complicated but it has many levels. I love going through Northanger Abbey and seeing all the times she parodies the Gothic novel. Do you find Austen re-readable? Miss Elizabeth Bennet of Elegance of Fashion is hosting a Period Drama Advice Event. This is the second time I’ve entered. I would like to appeal to all of you to vote for me. The post is here. My sister and I are reading through Emma together. We’re both really enjoying it and enjoying laughing at Mr. Woodhouse’s concerns and Mr. Elton’s pomposity. We were going to watch Emma 2009 (a.k.a. the four hour Emma) when we finished reading it through but we’ll probably be watching it sooner than that. I find that reading through Emma slowly and carefully really helps me to see it in a whole new light. The reason I picked Emma is that we had just finished watching Emma 2009, which is a very good adaption, and I felt that Emma was one of the less complicated of Jane Austen’s novels. Just Finished Watching Sense and Sensibility! I just finished watching Sense and Sensibility. It’s my favorite Jane Austen adaption even though S and S isn’t my favorite JA novel. I especially love the last few scenes – Thomas telling them that Mr. Ferrars is married, Edward’s proposal, and the wedding. I don’t know why, but by the time I’m at the part where they’re all trying to behave like nothing’s wrong when Edward visits, I’m as tense as Elinor must be. And then the wonderful wedding – all their troubles over and joy radiating from their faces – especially Colonel Brandon’s. Patrick Doyle’s gorgeous music for these scenes. Spring is in the air…and I’ve changed my blog header accordingly to one full one green grass and bright colors. Here is my previous header. Let me know what you think of the new header. I have arrived at Plymouth safely. I will be staying with Mr. Pratt during my tutelage. Before I left, my mother admonished me sternly. “Edward, I want only the best from you. Learn your lessons and do not disgrace our family. We have high expectations in regards to you and I will not be disappointed.” My sister, Fanny agreed with her as she does in everything. I promised to do my best and set out soon after. And now I am here, ready and eager to learn. I am doing better in my work than I expected. Mr. Pratt is a very good teacher and I hope Mother will be pleased with the reports she will receive shortly. Mr. Pratt hosted a small dinner party. I wasn’t expecting to be invited, but he did invite me. I thanked him for his generosity and went back to my room to study. The dinner party was very enjoyable. Mr. Pratt had invited his daughter and her husband. They brought along their two daughters, Miss Steele and Miss Lucy. They seem good-natured girls and Miss Lucy is quite pretty besides. After dinner we all adjourned to the drawing room. Mr. Pratt regaled his daughter and nieces with news of my progress. I felt quite embarrassed, but tried not to show it. Miss Lucy fixed admiring eyes on me. I tried to explain Mr. Pratt’s praises away. “Oh, I do not believe so,” Miss Lucy said smiling. I smiled back in return. Luckily for me, the subject shifted to Mr. Pratt’s relations, near and far. I took out a book of history that I had been reading earlier on in the day and did not intrude in their conversation. “…did I tell you that Mary has…how is Edmund…Louisa just went to…” Try as I might, I could not block out the conversation swirling around my head. I put down my book and looked over at Miss Steele and Miss Lucy. They were engaged in an animated conversation, which, from the snatches I gathered, about the merits of a new bonnet Miss Steele had just bought. Miss Lucy noticed me looking over at them. “And what do you think, Mr. Ferrars, of Ann’s new bonnet?” she asked brightly. “I don’t know. I had to buy something…” and they fell back into their conversation. I continue to do well in my studies. Mr. Pratt let me have a free day today. I decided to spend my time walking about the village near his home. I was pleased that I did so, for I met the Misses Steeles there. “Look Ann! There’s Mr. Ferrars!” Lucy’s cheerful voice reached my ear and I turned around to see them behind me. They were both in good looks and seemed pleased to see me, especially Miss Lucy. I let them come up to me and we all walked on together. “Do you often walk to Grovershire?” I asked Miss Steele. We walked on in pleasant silence for some time. “I believe that you are related to Mrs. Thomas Ferrars,” Miss Lucy said. “You found that out? I am quite flattered,” I said teasingly. We continued walking and chatting, till, noting the position of the sun, I reluctantly bid them good-bye and said that I hoped to see them again soon. However, I found that it was Miss Lucy that I most wished to see. I received a letter from my mother, grudgingly commending my work. I sat down and wrote a short, respectful reply. I find it easier to talk to my mother on paper than in person. Mr. Pratt spent most of the morning helping me figure out a troublesome problem. When we were done, I thanked him for his help. He does embarrass me at times by describing all my achievements in detail but he is very kind and helpful. I have begun to think that he does it, not so much to praise me, as to praise his abilities as teacher. My sister and I both really like Emma 1996. Since she has blond hair about the same shade as Gweynth’s, she let me fuss with her and the result was Gwenyth Paltrow’s Emma II. Do you think it a true likeness? Just before I start this post I want to point out that some of theses villainesses aren’t really villainous – just irritating and/or vulgar. BTW, you should check out my Jane Austen heroes and villains post. The Villainess: Lucy Steele is a true villainess. She heard Edward speak of Elinor with commendation and then forced the news of her engagement on poor Elinor and then gloats over her. Then, when Edward behaves so honourably towards her, she breaks the engagement and marries Robert for mercenary reasons. Lucy Steele is one of the meanest women Jane Austen created. The Heroines: The Dashwood sisters are two of my favorite literary heroines. Marianne is passionate and romantic while Elinor is calm and cool-headed. The two sisters are as different as possible, but they have a very strong bond between them that no-one can break. Marianne shows her heroism by comforting and supporting her sister while Elinor must keep Lucy’s secret to herself and never breath a word of it to anyone while all the time her heart is breaking. The Dashwood sisters are true heroines. The Villainesses: Louisa Hurst and Caroline Bingley are mean spirited – Caroline even more than her sister. Caroline is jealous of Lizzy because Mr. Darcy is interested in her. They pretend to be friends with Jane, and then meanly ‘cut’ her in London. And in the end, Caroline does not get her wish – to be mistress of Pemberly. The Heroine: Elizabeth Bennet is one of the finest examples of a literary heroine. She sparkles with life and wit. She doesn’t stand in awe of Mr. Darcy, but rather argues with him and refuses his first proposal, which, in the eyes of society would be madness. She doesn’t conform to norm of marrying for money, but instead turns down two good offers of marriage. The Villainess: Mary Crawford is something of an enigma. She witty, beautiful, charming – in short everything that one would want in a heroine. She would be a perfect heroine if she would not let her selfishness get in her way. She is kind to Fanny, likes Edmund, and is admired by all the Bertrams (is that a recommendation?). But she has corrupted morals which lead her into talking slightingly about Edmund’s decision to join the clergy, and blaming Fanny for Henry’s running off with Maria. The Heroine: Fanny Price may be shy and timid, but she is not dull or boring. She stays firm when everyone pressures her to be in the play and in refusing Henry’s proposal. Fanny has a quiet, inner strength. While not as engaging as Mary Crawford, Fanny has many wonderful qualities. The Villainess: Mrs. Elton isn’t really a villainess – she’s just vulgar and rude. She does influence Mr. Elton to snub Harriet, but that’s pretty much the extent of her villainy. Other than that, her greatest faults are calling her husband Mr. E and prosing on endlessly about Maple Grove. The Heroine: Emma is my favorite Jane Austen heroine. She’s a bit of a snob but she’s kindhearted and always means well. Sometimes you get irritated with Emma’s meddling but you can’t help liking her despite her faults her faults. The Villainess: Isabella Thorpe is very, very shallow and self-interested. I remember the first time I read NA I first thought that she was a good friend for Catherine, but as I got deeper in, I reversed my views. Isabella engages herself to James, flirts with Captain Tilney, and lies to Catherine. Not a very nice person. The Villainess: Elizabeth Elliot isn’t very much developed in Persuasion but we do know that she’s mean and rude to Anne. The Heroine: Anne Elliot is probably one of the kindest heroines in literature. She doesn’t become angry with her father and sisters, even though they take unfair advantage of her. Anne stays true to Captain Wentworth even though it seems that he has no interest in her anymore. Please tell me who your favorite heroines (and worst villainesses) are. I just want to say right away that this is the BEST version of Pride and Prejudice. Period. And if you don’t agree with me, we’ll just agree to disagree. 🙂 Now that I got that off my chest, we can go onto the review, can’t we? 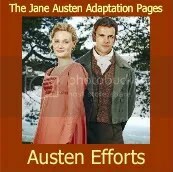 Accuracy to the book: Many Jane Austen fans view this movie as an interpretation of the book, rather than an adaption. I view it as an adaption. Several things have to be cut, of course, to fit the book into two hours, but it’s done well. The film doesn’t feel rushed for time, as other Austen adaptions do (Emma 1996 for one). And if you have a problem with watching three minutes of Lizzy swinging, the director put that in to give the audience a little time to catch their breath before the film turned a bit dark. By the way, if you think Mr. Darcy striding out of the mists is far-fetched, what about Mr. Darcy striding out of a lake in a wet shirt? Costumes: The costumes in this film are quite basic especially Lizzy’s. The waists are a bit lower than typical Regency styles, but the movie is set in early Regency. I love, love, love Lizzy’s Netherfield ball gown. The Bennet girl’s gowns are really nice, especially Jane’s. 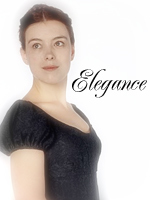 Lizzy wears a certain brown vest over a white blouse which looks very modern and not at all Regency. Any information on that? Scenery/Sets: The cinematography in this film is absolutely breathtaking. The sets may not be completely acurate to the time period, but Pemberly is A.M.A.Z.I.N.G. Music: The musical score is wonderful. I own the CD and listen to it all the time. Check out my review of it here and the giveaway for it here. Elizabeth Bennet – Kiera Knightly does a fabulous job playing Lizzy with her fine eyes, light and pleasing figure, and energy. She really makes the movie. Mr. Darcy – Matthew Macfayden also does an excellent job. He portrays Darcy’s shyness as well as his pride. When I first watched this film, I didn’t like him as Darcy very much, but he grew on me. The other characters are all, for the most part, well played. Jane is perfection (much prettier than the ’95’s Jane), as are all the Bennet sisters. Caroline is cold and haughty but Mr. Bingley is NOT my idea of Mr. Bingley. I like Mr. Wickham better in the ’95 version. However, most of the characters are better in the ’05 adaption than the ’95 one. My Overall Opinion: This is a great adaption of Pride and Prejudice and I highly recommend you watch it. Now all you die-hard ’95 adaption fans, despise me if you dare. I received four clever entries to my fan-fiction contest. I hope you enjoy them. I’ll be putting up a poll on the sidebar so you can vote on your favorite. Mr. Collins stood in stunned amazement as Miss Elizabeth Bennet proceeded to remove herself from his presence, closing the door on his proclamations of love. He could not fathom that she would be so insensible to the advantages of a match with one whom had the favor of Lady Catherine de Bourgh. A quizzical expression crossed his comical features. He could not return to Hunsford & face Lady Catherine’s scathing displeasure for failing to secure a suitable wife. He was willing to concede that Cousin Elizabeth might well be too strong-willed for Lady Catherine’s approval. Perhaps, he thought, one of his other cousins would be more to Lady Catherine’s liking. He began going over the Bennet sisters, trying to gauge which would be acceptable to Lady Catherine & her requiem. Tittering laughter broke into Mr. Collins thoughts. He knew that likely it was the laughter of his cousins, Catherine & Lydia. He began to contemplate Cousin Lydia, who was more pleasing to the eye than her elder sister, Catherine. Cousin Lydia, he reflected, sadly is too fickle & not easily led. Lady Catherine would not be amused by Cousin Lydia’s inappropriate outbursts & reckless behavior. Cousin Catherine, while nearly as fickle as Cousin Lydia, could if given into Lady Catherine’s capable hands, be molded into an amiable, demure wife, one whom, Lady Catherine would be pleased to give her condescension. “Yes,” Mr.Collins said aloud, to no one in particular, “I shall address my attentions to Cousin Catherine.” Having resolved to a course of action, Mr. Collins began to prepare & rehearse his decrees of ardent admiration, as well as those of his future bride. For Mr. Collins was assured that Cousin Catherine would not be so insensible as Cousin Elizabeth. When he had committed to memory his speech of affection, he betook himself to find Mrs. Bennet, that he might be granted an audience with Cousin Catherine. Mr. Collins did not need to search far. Mrs. Bennet burst forth from Mr. Bennet’s study, a look of exceeding consternation written upon her brow. A facade of apologetic sympathy rushed over her features as she spied Mr. Collins coming towards her. “Oh, Mr. Collins, I do wish to deeply apologize for the behavior of my foolish daughter.” Mrs. Bennet barely paused for breath before opening her mouth to continue. Mr. Collins raised his hand with an attempt at a smile, though twas more like unto a sneer. “My dear Madam, do not fret yourself. I desire an audience with your daughter, Catherine, if I may be so forthright.” The sardonic smile remained throughout his pallid plea. “What is it, Mama?”, came back from the vicinity of Kitty & Lydia’s bed chamber. Mrs. Bennet’s day cap bobbed up & down as she took the steps as rapidly, as her age & less than lithe figure, would allow. “Do not cross me on this Kitty! Do as I say & go!” With this Mrs. Bennet half pushed, half dragged Kitty down to the parlour. Mr. Collins looked up, the leering, sneering smile of condescension permeating his entire being. With one final push & a look of threatening, Mrs. Bennet withdrew, closing the door behind her. Being Mrs. Bennet & also wishing to ascertain that Kitty received Mr. Collins with favor, she pressed her ear to the solid oak plank door, straining to hear & not be heard. Kitty watched her mother leave with a sense of trepidation & uncertainty. The sensation of needing to cough came so forcibly over her, that she could not suppress it. Coughing proceeded for several seconds. Mr. Collins marched to the door & ignoring Mrs. Bennet’s pleas to reconsider, he retired to his quarters. Meanwhile Mrs. Bennet burst into a symphony of wailings & a fountain of tears. Kitty ran to be consoled by Lydia, coughing all the while. Amongst all the mayhem, Miss Charlotte Lucas entered. Thus with her entrance, so ends our tale of tragic unrequited love. By the way, it is meant to be somewhat satirical, like Jane Austen’s style. A strange hole in the Austenite world is opened. An unseen, horrid, and relentless enemy pores into the breach. Retired Lord High Admiral Sir Edward Pellew(Happy belated bday to actor Robert Lindsay, who so nobly played Adm Sir Edward Pellew in the A&E series Horatio Hornblower) was tapping his fingers impatiently.”Good heavens, Prime Minister, I thought we had strange times and impossible challenges when we were vanishing Boney! William Pitt the younger(from Amazing Grace) smiled thinly.”Yes, I wish I had lived to see it. But never mind. I’m sorry to call you Sir Edward into active service. However, you are best choice to command the overall operation to battle the Ghost Fleet and save the Austenites. As you can see Sir, the Ghost Fleet has destroyed multiple other literature groups. Whole groupings wiped off book shelves and the face of the Earth! Each time they have gained strength and added to their fleet of sfy ships. It seems they have been pointing towards this battle from the beginning. They did avoid battling Dickens and Shakespeare. Indeed, they saluted those fleets. There are bizarre rules. Who will you have commanding the fleet on the sea? Nelson? Sir Francis Drake? Sir Francis Knollys? John Baker?” Sir Edward respondes firmly “Hornblower”! The place: Westminster Abbey. All the cast and crew from the A&E series were there. Lt. Archie Kennedy and Capt. Bracegirdle restored to life. Sailors Styles and Matthews, given massive rewards by Hornblower for their yrs of faithful service, looking like lords. Styles to Matthews “He looks just abit happier this time around! Didn’t touch his breakfast when he married the late Maria. He had two breakfasts this morning!” Everywhere Adms-Vice, Rear, and Full. Lord Major Edrington leads the Army side. Chapter three-How do I get this story moving? Or, what’s Jane got to do with it? The wedding is a joy for all! Hornblower, however, catches a look of concern from his new father-in-law. Hornblower has seen that look before. At his 1st wedding. Given the dangerous mission to find the missing ship the Grasshopper.Given one day’s shore leave by the benevolence of Sir Edward. No other commander would been so generous. When the two great men are alone, they share many moving moments. “Son!” “Father”(Hornblower is an orphan). Both are overcome with emotion for several minutes. Sir Edward owed several promotions, and his life and ship in one battle, to the incredible work and insight of Hornblower. Hornblower owes an equal debt to Sir Edward. Now, joined together as family! Not even Hollywood could have…. Sir Edward gathers himself for a moment, “Come on now, let’s be cheerful. I could not have given up my “Jenny” to anyone else less worthy. Indeed, not to anyone else in all of Christendom”. Hornblower could only respond “You once said you hoped I would fight for more than England, That day has come!” More moving silence. Hornblower then says “did I deduct a concern?” Sir Edward regains his composure “As I said before to you “You see things that other men do not Sir” I can’t command you, nor will I, to accept this mission. Indeed I command you to not think about it for five days! Cutting and consuming of pie and cakes. Scenes of general merriment. You will have four ships….Captain Wentworth(The Persuasion), Adm. Croft (The Sense and Sensibility, (ok ok so he was in Persuasion too, can’t have two boats with that name! ), Adm. Francis Austen(The Pride and Prejudice) , and Rear Adm Charles Austen (The Jane) will command them. Lt. William Price will assist you. The Austenites must contribute at key moments. The Americans, good thing you never directly battled them, have given us four USS Constitutions. The battle will take place from Cape Cod bay down to Martha’s Vineyard and Nantucket. You will go up and down three times. You must stay within three miles of shore. Finally, you can’t fire upon the Ghost Ships. “Can’t fire Sir?” “Yes, the firing will do not good. indeed, the cannon balls get pulled into the bleak,black clouds above Ghost Fleet and come back out to hit the firing ship”. Blessing of the Austenite fleet by Rev. Henry Tilney, Rev. Edmund Bertram, and Rev. Edward Ferrars. Edward’s blessing is worthy of Henry V at Agincourt. He practised his blessing many times with Marianne Dashwood (picture Kate Winslet…hehehe important for later in the story). Elinor Dashwood beams with delight. Margaret Dashwood consults her atlas. As the fleet is becalmed, two riders are sent on a mission. Col Brandon rides up the Olde Kings highway(known as 6A today). Thru Barnstable, Brewster, Dennis, and Orleans he did ride like Paul Revere. “The Ghost Ships are sailing!”. He continues on to EASTHAM, Wellfleet(Hi Lady Anna Elena B-private joke), Truro(visiting Atlantic Spice, but avoiding the Pamet Puma), and finally P-Town(he earned his fish dinner at Napa’s)..
Mr. Darcy rides up the Mid-Cape Highway(Rt 6). Mr. Darcy perceived anti-sisterhood propaganda. “Save your children(and yourself) from Brit lit”! “stop the British invasion” “Austen unfair to W characters”. Mr. Darcy grimaced at the awful slogans. Mr. Darcy grimaced at the equally repugnant handwriting….it could only be…..”WICKHAM”! Mr. Darcy spurred his hired horse on. At Hyannis, Mr. Darcy caught up with Wickham. (who was ‘dancing in the Streets of Hyannis’-Boston) Despite Wickham’s desire to remove himself from Lit’s Hall of Shame…Darcy’s bribe and forceful removal to a packet sent Wickham bound for that hive of scum and villainy known as ____. 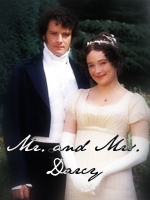 Mr. Darcy allows himself a small grin…..”I can’t wait to read P.D. James new book…where Mr. W. gets his”. “We need someone to run 3+mile width of EASTHAM from 1st Encounter beach(bay side) to Nauset Lighthouse(Ocean side) to view the speed of Ghost Fleet . Small and white, clean and a bright light, Nobska lighthouse the village of Woods Hole, four miles from Falmouth, is reached by the Austenite fleet. “We must send someone to Falmouth to charm the summer people. Need supplies and ship pilots to get thru the hazardous shoals around the Elizabeth Islands”. “I had am ready Sir” cries out Emma(picture Romola). “Who will you bring with you” says Mr. Knightley. “Why you, if you ask”. Emma’s youthful spirit and Mr. Knightley’s courtly bearing so charm Falmouth that Katherine Lee Bates(Falmouth born, Wellesley College Prof!) writes a new version of America the Beautiful called “Emma the beautiful”. Hornblower checks his land charts. “Mr. Bush, we need someone from Sisterhood(of Austen main characters) to climb the highest point quickly. We must determine those bizarre images above the Ghost ships. Who among the sisterhood is the best climber with the best vision? ” Catherine Morland bonded up the stairs of the Pligram’s Monument, with athletic grace, in true heroine fashion. Her eyes, while not as fine as Lizzy’s fine eyes, were of highest optical power. She peered to the absolute edge of her optical power. She saw the images of ……………Moors(!!) above the Ghost Ships. The names of the ships as well. the Emily, Charlotte, AnneB , and Bramwell were the main ones! Catherine raced down the step in world record time. No else would have been able to make it back in time. She gives her full report. “I’ll send them flying or to Davy Jones locker”. As the Brontes(nor their fleet) didn’t obey rules of physical placement/plot rules, he could only send them flying. That he did in the style of field goal kicker. Ship after ship went out of the 3 mile engagement boundry to never return(we hope)! Meanwhile,the AnneB and the Emily were cutting the distance to Captain Wentsworth ship. Majestic Santaky Head light getting ever tantalizingly closer. Sconset and moors just beyond. Una’s sublime red hair being tossed about in the fresh breeze. Her pushing off from shore in a row boat. “We need to lose more weight, stat’” cried the good Captain. Edward Ferras, in the guise of Dan Stevens S&S 08, chops up a desk, wooden boards, etc. (when swabbing is required, Hugh Grant steps into the role). Elinor Dashwood helps toss the weight over board. “Anne”, I will put you into Una’s row boat”. Only Anne Elliot, her exceptional mind even more improved by extensive reading, can id the plant in the moors. It is another couple of miles to the moors to run. The transfer of Anne put The Persuasion back into danger. Capt. Wentworth pulls a nearly impossible wheel move worthy of those famous 20th Maine boys(on land). No further help is needed. However, if it was.. the marvelous(marvin hagler?) Blue Whale-Big Ben, arrives on scene grininng across his great and timely(sorry!) face. “you are bad birds(I mean authors) you Brontes”. He breachs, sending the Bronte ships skimming far out to sea. The Persuasion is rocked(and nearly rolled) too but Capt. Wentsworth makes all the right commands. Anne and Una are too far from the sea action to check. They run….Anne turns an ankle. However, Una is strong enough to nearly carry Anne. The Bronte fleet are half way to the Azores when Anne finds the plant. The solution is created, pufff goes the Bronte fleet. The world is safe for Austenites! Marianne joyfully celebrates by climbing on the bow and sings “Near, far, wherever you are, I know that MY heart will go on!” Col. Brandon beams! Elinor is appalled. Catherine and Emma take command of the bows’ of their ships! And who should take command of the 4th bow?? Yes, of course, it is the AUTHOR(picture Anne Hathaway as the AUTHOR)!!! The weekly Jane Austen and her characters’ ball was being held at Netherfield. Mr. Bingley and his wonderful lady always give the most graceful gatherings. The standing rule for dancing is that the first two dances may be with one’s spouse. Jane Austen, of course, not being married, and being the creator of all is exempt. She spends many dances with Tom Lefroy(“everything most profligate and shocking in the way of dancing and sitting down together”). The mysterious man of the seaside is called upon to dance as well(alas gentle reader, it is beyond my powerless pen to provide a description). Cassandra Austen sits with her Tom Fowle. After that merit and contests determine dance partners. Henry Tilney, as guest of honor, determined a piano playing contest for his dance partner after the first two dances with his heroic and delightful spouse Catherine Morland(Catherine would give the Queens a run for their money piano playing. She has learned much). Jane Austen flashed Henry Tilney a wicked smile. They both know it would be a contest between those two less than fully proficient/hardly ever practicing Emma and Elizabeth. The Queens of Highbury and Pemberley enjoy a warm friendship at the Austen Character Balls. Emma and Elizabeth eye Henry Tilney across the room. A fine dance partner indeed. I have been remiss not to state that Elinor Dashwood was in the room as well. She is engaged to Col Brandon for the second two dances. Much to discuss about Elinor’s sister, who is still singing (“You’re here/there’s nothing I fear/And I know that my heart will go on….”). As this is my alternative universe, let other pens dwell on that difficult sister of Elizabeth, Lydia Bennet. We would be seriously displeased (and have a headache!) if she had a speaking part here. Emma chooses the theme to BBC 09 for her musical selection. She smiles and laughs as she plays, thinking about her first dance with her spouse(“who will you dance with”…”why you, if you will ask me”). All in the room note (oops, bad pun warning) Emma’s improved playing. The time spent with her new best female friend in Highbury, currently in Ireland visiting the Dixons and not available here, has greatly improved Emma’s playing. Elizabeth knows she is beaten but her courage rises to the challenge. She gives a delightful account of the P&P theme 95. Her playing makes her delightful and talented sister-in-law proud(she will praise Elizabeth’s improved playing to her noble brother). No shades of Pemberley were polluted by Elizabeth’s playing! Alas, there can be only winner, and Emma carries the day. Fear not Elizabeth fans, she gets the next two dances after Emma. By a partial, prejudiced, & ignorant “author”(lol, who can’t write very well). and to help your spirits rise. then marry one and leave you in the dirt. “What?! Like him?! Esteem him?!?! 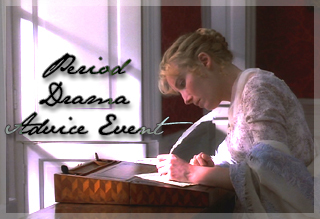 Miss Elizabeth Bennet from Elegance of Fashion is hosting a Period Drama Advice Event. This is the third letter and my answer. Let me know what you think. I received a proposal from a dear friend of mine, John Chivery. I refused him because I do not love him. I am very fond of John, but I could never feel that way about him. I wish I could; it distresses me to see him unhappy, but I can’t love him — not in that way, not to be his wife. I would rather stay and look after my father than marry someone I do not love. I hope he will find a good wife one day because he deserves one. I am in love with another man, Arthur Clennam, but he is in love with someone else who I don’t know. And now because I refused John, everybody is unhappy or angry with me. What should I do? Mother and I were so pleased to see your lovely letter in the newspaper’s advice column this morning. Mother was so pleased. She said “I never saw a better letter in my life.” And then I said, “But mother, remember Jane’s letters.” Jane’s letters are always so fine, you see. Speaking of Jane’s letters, she really ought to be writing this letter because her handwriting is so even – not unlike Miss Woodhouse’s handwriting. Sometimes Mother can read Jane’s handwriting, especially after kind Mr. Frank Churchill fixed her spectacles. They were quite good as new. And Mother can always hear Jane much better than she can hear me – Jane has such a clear voice…now where was I? Oh, yes, your predicament. I really have no experience in such matters, having never been proposed to myself, but I will try as best I can. Jane really should have written this letter although I do not believe she has ever been proposed to. However, she is a young lady like yourself. And Miss Woodhouse would also be an excellent person to write to you. She has a great history of matchmaking – did you know that Mr. and Mrs. Weston were married because of her? But of course you couldn’t know, not having lived in Highbury…maybe you should visit us in Highbury. I’m sure Miss Woodhouse could find you an excellent husband. But no, you don’t want to leave your poor father. Maybe I can persuade Miss Woodhouse to write and advise you. She is so kind – she sent us a beautiful hindquarter of pork the other day…Mother was quite enraptured and I was too of course. Dear me, how I ramble on so! It must be tiresome. I will show Miss Woodhouse your letter as soon as possible and ask her if perhaps she could advise you. I am so pleased to be of service to you, Miss Dorrit. Jane Austen Heroine Week has been a big success (IMHO). This post will look back over all the posts that have come up this week. Day 1: I started up a fan-fiction contest and a little blog award draw. Congratulations to Jill! She won the blog award draw. Thank you to the other seven bloggers who entered. I will be posting all the fan-fiction entries I received later on and I’ll put up a poll so you can vote on your favorite. Poll Results: Emma Thompson received 16 votes. Hattie Morahan received 4. Day 2: I posted a set of tag questions. Thanks to all who answered them. Poll Results: Kate Winslet received 15 votes. Charity Wakefield received 2. Day 3: On day three I posted a set of words to unscramble. Here are the scores. Poll Results: Jennifer Ehle received 15 votes. Kiera Knightley received 8. Day 4: Day four was two wonderful guest posts by two wonderful bloggers. Poll Results: Sylvestra Le Touzel received 4 votes; Frances O’ Conner, 7; Billie Piper, 7. Day 5: I posted the results of a Jane Austen Heroine Quiz and talked about my favorite heroines. Poll Results: Gwenyth Paltrow received 8 votes. Romola Garia received 7. Day 6: On day six, I posted my tag answers. I had a lot of fun! Poll Results: Amanda Root received 5 votes. Sally Hawkins received 2. Day 7: I started up a great giveaway for a P and P 2005 soundtrack. I highly suggest you check it out. Poll Results: Margaret Dashwood, 6; Charlotte Lucas, 2; Jane Bennet, 8; Georgiana Darcy, 4; Mary Crawford, 1; Harriet Smith, 2; Jane Fairfax, 5; Eleanor Tilney, 4. Please take a little time to complete a survey about JAHW. The JAHW is drawing to a close. It’s been a great week. A big thank you to everyone who participated especially Miss Laurie of Old-Fashioned Charm. Note: I will try to get the concluding post up tomorrow but it might have to wait until Monday. 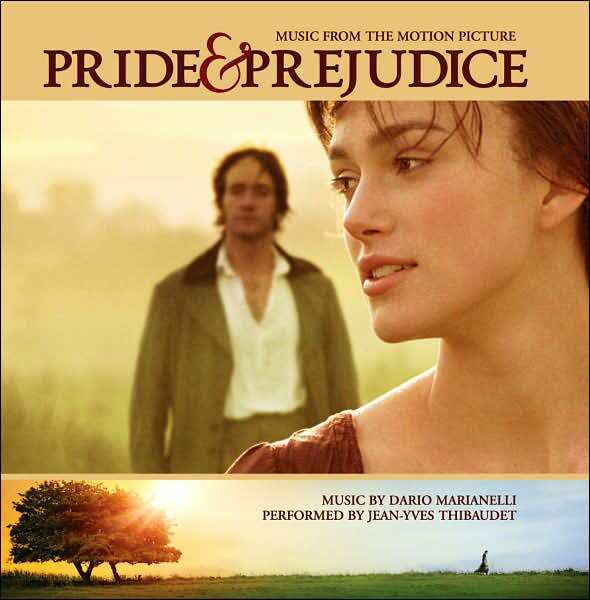 I have one lovely copy of the Pride and Prejudice 2005 soundtrack to give away. I know that the ’05 adaption isn’t everyone’s favorite, but the music is truly wonderful. You can check out my review of the soundtrack here. The giveaway ends April 1st. For a mandatory entry, comment and tell what your favorite Jane Austen adaption is. I will randomly pick a name out of all the people that entered. I will then e-mail you and get your address so I can mail you the P and P soundtrack. The extra entries detailed below are not mandatory but they do increase your chances of winning. This giveaway is only open to the residents of Canada and the United States. Share the link to this giveaway on Facebook. Tweet about this giveaway on Twitter. Post about this giveaway on your blog/website. When you comment for this extra entry, include the link. The reason I’m not having a poll between the two Catherines is because I think everyone likes Felicity Jones the best. The older BBC version is atrocious. I couldn’t even finish watching it that’s how bad it was. NEVER watch it! Henry Tilney looks HORRIBLE! Instead, I’m putting up a Secondary Heroine Poll. I couldn’t find any secondary heroines for Persuasion (poor Anne is pretty much on her own). Here are my answers to the tag questions I posted earlier this week. What, to you, defines a Jane Austen heroine? 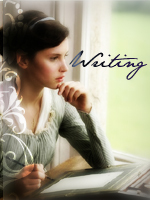 Miss Elizabeth Bennet wrote an excellent guest post on this subject. I would say that a sweet temper and a willingness to help others in need is one of the main characteristics of an Austen heroine. Which Austen heroine is your favorite? Emma Woodhouse. Even though she’s pretty irritating during the first part of the book, she is still my favorite. I enjoy watching her make mistakes, and then try to resolve them. What is the quality you like best about her? Despite being meddling, Emma has a kind heart. She is very kind to Harriet and after she snubs Miss Bates, tries hard to make things right. Which actress plays your favorite best? My favorite portrayal is Gwenyth’s but Romola Garia runs a close second. Romola seems a little too modern for my taste, while Gwenyth is perfect. Who is your favorite secondary heroine, (e.g. Jane Bennet, Jane Fairfax, Mary Crawford)? Which actress plays your favorite secondary heroine the best? I prefer Rosamund Pike’s portrayal of Jane over Susannah Harker’s. If you could have tea with a Jane Austen heroine or secondary heroine, who would you want to meet and why? I think Fanny Price would be interesting to talk to. I would really like to know more about her. Who is your least favorite Jane Austen heroine? Anne Elliot. Even though Anne has many wonderful qualities, she is my least favorite heroine. I still like her, but she’s not my favorite. Why is she your least favorite? I don’t really relate to her but I can’t really pinpoint the exact reason. What is your favorite Jane Austen heroine quote? Anne Elliot is a kind and steadfast heroine. 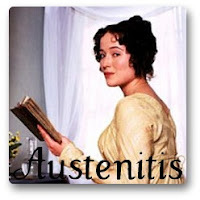 She is the oldest of all Austen heroines. Even though Anne is not my favorite heroine, she does have some first-rate qualities. Anne is not snobbish like her father and sister, and to some extent, Lady Russell. She very much deserved to marry Capt. Wentworth. Today I’ll just be posting a few random things. You are Elinor Dashwood of Sense and Sensibility! You are practical, circumspect, and discreet. Though you are tremendously sensible and allow your head to rule, you have a deep, emotional side that few people often see. If you want to take the quiz, go here. I think I’m like Elinor in more ways than one. I certainly relate to her better than I do the other Austen heroines. Let me know what you are. I would just like to talk a little bit about my favorite heroines and why they are my favorites. Emma Woodhouse – Emma is my all-time favorite Jane Austen heroine although (thankfully) I’m nothing like her. To me, she seems somewhat the most human of all Jane Austen’s heroines because she makes mistakes and has to live with the circumstances that go with them. But underneath all her meddling, Emma is very kind-hearted and always means to do well. Elinor Dashwood – Elinor is another one of my top favorites (there’s a reason my blog is called Elinor and Emma). Elinor embodies the qualities that I want to have. She calm, kind, understanding, and even witty (“Not everyone has your passion for dead leaves, Marianne). Elinor keeps her wits about her when Marianne is ill. She provides a firm rock for her mother and Marianne to lean on. Elizabeth Bennet – Elizabeth is the perfect example of a literary heroine. Witty, energetic, and always ready to do what needs to be done. Elizabeth is my third favorite heroine. She has to cope with her two youngest sisters and to some extent her mother, and does it admirably. She turns down two offers of marriage because she will not marry without love. Marianne Dashwood – Marianne Dashwood is a great favorite of mine. She’s highly romantic and not afraid to speak her mind. But Marianne is also a wonderful sister to Elinor and defends her several times (e.g. when Mrs. Ferrars is admiring Miss Morton’s painting). And Marianne realizes, through the course of the book, that it is possible to fall in love for a second time (and to a much better man). If you want to get my opinion of Emma, just read the section in this post about her. Emma is my favorite Austen heroine. Today I will posting two lovely guest posts by two lovely bloggers – Miss Laurie and Miss Elizabeth Bennet. The first one is by Miss Laurie. Jane Austen’s heroines are definitely my favorite ladies in all of English Literature. I’ve spent so much time reading their stories, watching their film adaptations and dreaming about their lives beyond the books that I sometimes feel I know them better than I know myself! It’s difficult to choose which of the Austen heroines are is my favorite because they are so wonderful! Here I’d like to talk about the ladies who make it into my top three favorites. Anne Elliot of Persuasion – Anne’s virtues are many! She is sweet, patient, kind, selfless, tenderhearted and mothering. She loves her family even though they frequently neglect her. She is a faithful friend, a caring aunt, a good listener and acts upon what she knows to be right. Her one fault is having not believed in her own good sense and worth enough to marry Captain Wentworth when he first asked. I identify with her in a way but until I had patience like a saint I could never be as constant as Anne. Loving as she did when all hope is gone can only come from a deeply attached heart. Her heart aches with regrets and yet still her sense is invaluable and she is always of use to those around her. She has the great elegance and sense that I especially admire in a heroine and hope to have myself. I admire her greatly and rejoice in her final gain of the man who truly loves and appreciates her. Miss Anne has been a favorite for a long time and each time I re-read Persuasion I just grow to love her more! Catherine Morland of Northanger Abbey – As the heroine of my favorite Austen novel Catherine has a lot of charm for me. She is young, a home school graduate, a minister’s daughter, loves her family very much and has a bit of a curious and adventurous spirit. She was a bit of a tomboy as a girl but is finally growing up into a lovely young woman with a taste for feminine things. She has a great love of books and enjoys their mystery and romance. Her faults are few but one of them is an overactive imagination (fueled by the novels she reads) that gets her into trouble sometimes. One great thing about her is that she is so pure of heart and makes decisions based on her good heart and a desire to do what is right. I have identified with Catherine many times over the past few years – like her sometimes my love of mystery and romance tales makes my imagination run away with me. Being young she has a lot of time to grow into the wonderful wife and mother that she will be. Fanny Price of Mansfield Park – In the last few months Miss Price and I have become fast friends! Every time I read about her I find more to admire! I used to think that Fanny was just painfully shy, but she’s not really, she’s more methodical and chooses her words carefully. Even though Fanny is young she is so sweet, kind, caring and helpful to the people around her. She was a good big sister to her many siblings and when she’s transplanted it takes a little bit for her to start growing out of her shell but Mansfield Park really does become her true home. She has a good heart and a good head and always tries to make right decisions. She’s a good judge of character and stays firm to her purpose. Fanny has an abiding faith in God which guides her actions, even Henry Crawford sees this. She loves her hero faithfully and prays for his happiness even when he seems to be in love with another woman. I love Fanny dearly and strive each day to reach her level of Christian faith and virtues! And I can’t finish without briefly mentioning dear sensible Elinor Dashwood of Sense and Sensibility. She’s a favorite too and I love everything about her story but sometimes she’s a bit too much like me! I hope to have as nice and happy an ending to my story as she has to hers. Thank you Eva-Joy for hosting this lovely Jane Austen Heroine Week and for inviting me to talk about my favorite Austen heroines! After reading one of her books, we really get a sense of who Jane Austen’s heroines are. We learn their habits, their virtues, their vices, we understand what they are thinking and how they are feeling, we could read a quote and say “Yep, that sounds like a Lizzy Bennet.” But what is it that defines an Austen heroine? What characteristics do they all share that define them as Austen heroines? After all, not all Austen Heroines are the same. Jane Austen’s heroines reflect people that we may see in our lives (or maybe even ourselves), and though they are not identical, they share similarities that make them heroines. Some could even be considered opposites. For example, Emma Woodhouse from Emma and Fanny Price from Mansfield Park are pretty different when it comes to personality: Fanny is shy, and Emma is outgoing; Fanny has been described as dull, while Emma has been described as vivacious. But despite those differences, they have those qualities that make them heroines (for example, both attend and are involved in their church). As you read this post, keep in mind that some of the characteristics that I mention may apply to some heroines more than others. Though not to say that her sister, Marianne, has no sense of morality, Elinor has both good sense and morality that makes her the strong moral rock in Sense and Sensibility. While reading Sense and Sensibility, there are times where Elinor tries to think the incidents of the novel with her good sense and morality. She tells Marianne when she is acting improperly (like when Marianne was touring Allenham with Willoughby: Elinor says to Marianne, “”I am afraid…that the pleasantness of an employment does not always evince its propriety”). Elizabeth has a very strong sense of morality and the right way to act. She knows her younger sisters act improperly: they shamelessly flirt with all of the officers and don’t seem to have any propriety. When Mr. Bennet refused to take all the Bennets to visit Brighton to visit the militia, Elizabeth is relieved since she knows how her younger sisters would act and how it would look to all of the Bennets. But when Lydia tells her that she is to go with Mrs. Forster, Elizabeth, with her sense of morality and knowing what Lydia is capable of acting like, pleaded with her father saying that he cannot let her go to Brighton because of Lydia’s wild behavior. She knows that Lydia’s behavior would affect all of the Bennets, and she proves to be correct when Lydia elopes with Wickham. Now, having not completed Mansfield Park (which I really need to get back to), I cannot fully comment on all of Fanny’s behavior, but I think I have a clear enough of a picture of her to write up a short section. Fanny has a very high sense of morality, which can lead to many readers finding her dull (though I certainly do not!). That is what I like about Fanny, that in contrast to Mary Crawford she has a very strong sense of right and wrong. When Mary Crawford makes inappropriate remarks at dinner, Fanny realizes that it was wrong of her to do so. “I cannot speak well enough to be unintelligible.” This is one of Catherine’s most well known quote. Catherine, though she is a bit naive, is very honest. She doesn’t always put things delicately, but you can never accuse her of purposely misleading anyone. When she was caught exploring Mrs. Tilney’s room at Northanger Abbey, she doesn’t cover up why she was there: she tells Henry Tilney up front why she was there; now, perhaps in that instance, she didn’t need to mention her suspicions of General Tilney, but she didn’t lie about why she was in Mrs. Tilney’s room. Could anyone accuse Marianne of saying anything that she did not have her full heart in? No. Because she has so much heart in everything she says and does, Marianne is very honest…Sometimes too honest. If she doesn’t like the way Mrs. Jennings is acting, she doesn’t hide it. In some instances, she can sometimes say some mean things because of her severe honesty. She probably needs to work on putting things more delicately, but she ought to keep her honesty. All of Jane Austen characters have a good nature. There are many levels to having a “good nature”, but Jane Austen’s heroines have a good nature in more than one way. For one thing, there really isn’t any malice in any of them. Sure, they may be wronged, but we don’t see them say that they wish ill on those who wronged them. 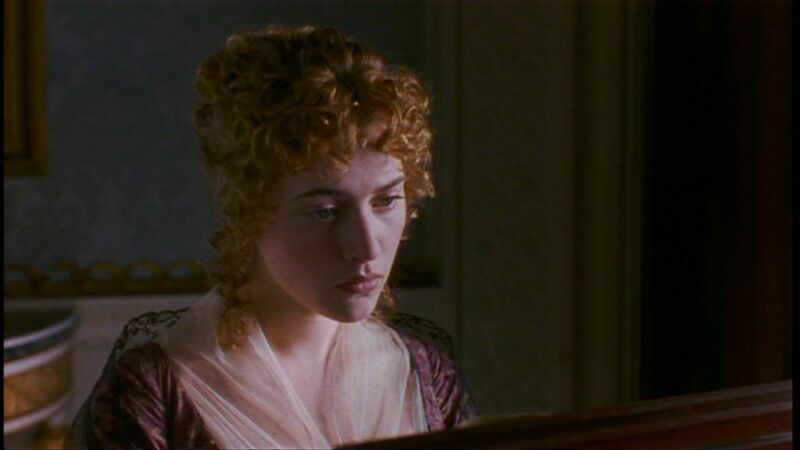 For instance, in Sense and Sensibility, when Marianne recovers from her illness and though Willoughby was the cause of it, she didn’t wish ill on him: she only wishes that he will suffer no more than she has. What can also fall under a good nature is good intentions. In Emma, Emma Woodhouse makes a lot of mistakes, but you have to remember that she means well. She doesn’t mess up on purpose, but she genuinely wants to help out her neighbors, though her attempts are usually met with failure. There is also a caring nature apart of that good nature. Persuasion’s Anne Elliot is possibly one of the most caring characters in literature: she is a good listener and listens to all of her family’s problems (even when it’s about other family members) and she helps wherever she can. Sure, for a good nature, some Austen Heroines have different elements of a good nature, but they are all good-natured women. Those three characteristics are some of the ways that an Austen Heroine can be defined. Jane Austen has created a variety of characters and a variety of heroines that though they are very different from each other have those characteristics that bind them together. In each of her heroines, we can see the role models that Jane Austen intended. 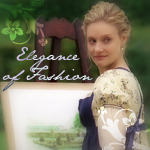 Miss Elizabeth Bennet runs Elegance of Fashion – an excellent blog full of great posts. Thanks for joining me on my JAHW, ladies! As Miss Laurie said, Fanny Price is not dull or boring. She is one of my favorite heroines. I can’t really say anything more than Miss Laurie said, so I’ll post the poll and be done. Today I will be having an unscramble game. Here’s how it works: All the words are something that to do with Jane Austen’s novels – they can be people, places, or things. Once you’ve unscrambled all that you can, send me an e-mail at kraftyhorselover@hotmail.com. I will send you an e-mail back telling your score. You can get two points for each correctly unscrambled word. The total number of points possible is 36. Have fun! I’ll be posting the answers and the scores on the 18th. I hope I haven’t made them too difficult. Elizabeth Bennet is one of the best-loved heroines of literature. Her liveliness and wit appeals to everyone. She doesn’t bow to the social expectations of her day. She refuses two proposals of marriage- both of which would have given her a comfortable home. Elizabeth Bennet is a true heroine. The second part of JAHW is a set of tag questions. We all love answering tag questions, don’t we? I’ll be posting my answers later on this week. I hope you will enjoy answering these tag questions. Marianne Dashwood is the highly romantic and passionate. She has no ‘middle ground’. She either loves something or hates it – there can be no compromise. Marianne is very honest – sometimes almost rude. She hates deceit of any kind which I believe is one of the reasons she is so heartbroken when she finds out how Willoughby deceives her. Marianne may not be my favorite heroine, but she has much to recommend her. To start off the JAHW, I will be hosting a fan-fiction contest. Here’s how it works: E-mail me at kraftyhorselover@hotmail.com with your entry. It can be anything – poem, short story, letter from one heroine to another, anything that has to do with Jane Austen’s heroines. The deadline is March 18. I will post all the compositions I received, and put up a poll, so you can vote on your favorites. If I receive more than six entries, I will have a first, second, and third prize, so please refer this contest to your friends. I will contact the winner(s) by e-mail to find out what picture they want their winning button to use. I also have a little contest where you fill out the form below and you will be entered to win a beautiful button. Have fun! Elinor Dashwood is probably my favorite JA heroine. She’s calm and clearheaded and is the perfect balance to Marianne’s highly romantic nature. Every JA heroine quiz I take, the result is either Emma or Elinor and usually Elinor. Elinor is my ‘ideal’. Every day I will have a poll asking which actor you like best as the featured heroine. I will be only including the ones from ‘modern’ movies since I don’t think the old BBC adaptions are very good.